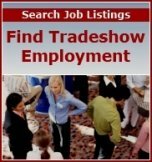 Want Strong Trade Show Results? Avoid These Exhibiting Mistakes! Booth Staff Texting — Walking by a trade show display and seeing a company representative "all thumbs" avidly texting on his or her phone sends an immediate signal to event attendees: "Don’t bother coming into this booth. I’m not interested in helping you or promoting my company products." The outcomes from texting while on "booth duty" include fewer exhibit visitors, less-than-optimal leads, and unrealized sales opportunities. These outcomes are also similar for the other bulletted items listed below. Booth Staff Talking on the Phone — While cell phones are a necessity in business, they don’t have a place in your display area. This is especially the case if your booth representative is on a personal call. Cell phones should remain turned off and stored in pockets and purses so they are out of site. All attention needs to focus on attracting and meeting the needs of trade show attendees. This can’t happen if a team member is talking on the phone and missing potential sales opportunities. Booth Staff Seated in the Display Area — There's no doubt that standing for hours in an exhibit area is wearing on your feet, even when donning the most comfortable shoes. Yet, when a booth representative is not standing alert and enthusiastically greeting visitors, you can count on a less-than-optimal return on investment. Booth Staff Eating in Your Booth — Trade show attendees do not want to see members of your team eating lunch, munching on snacks, chewing gum, or similar while they are visiting your booth area. Eating on the job detracts from your company and staff's professionalism and deters people from entering the exhibit. Ensure your scheduling allows for ample time for people to satisfy their hunger before and after booth shifts. No Sales People in the Booth Area — The costs associated with booth rental, display production and shipping go down the drain with an unmanned exhibit where there is no representative to attract and greet visitors, share product information and collect leads. To help ensure strong trade show results, booth staff must be scheduled so there are absolutely no gaps in time, even for lunch or a short break during the show. Placing Candy and Giveaways Upfront — Keep your valuable giveaways at the back of your exhibit or even out of site. Hand them out only to high opportunity prospects to ensure you are making the most of your trade show budget. Otherwise, your freebies will disappear quickly and may be of no benefit. No Lead Collection — Your team can be engaging and knowledgeable about your product. Yet, if names, contact information, and other key information is not collected for each potential buyer, then your staff's time and effort, along with your investment in show participation, is wasted. As part of the trade show planning process, have a specific system for your team to collect and rate leads. Then, have your sales team follow-up with the "hot" and "warm" prospects within five days of the show. Phone calls are the best follow-up strategy for your best ("hot") leads. Direct mail and email communication can be used to contact your moderate-potential ("warm") propsects. No Way to Purchase Your Product at the Show — If your objective for event participation is to sell your products, make sure you have a way of writing (and scheduling) orders and collecting payment by cash and/or credit card during the show. If your sales team is knowledgeable, professional and effective, chances are good that people will be ready to buy on the spot. Make sure visitors can complete their purchase before leaving the exhibition hall. Debris and Trash in the Booth Area — Keep your booth area in pristine condition at all times. Empty boxes, crumped papers or leftover drink cups will compromise your image and effectiveness. First impressions count. No Follow-up After the Show — Your booth team can do a wonderful job of attracting visitors to your exhibit and promoting your products and services, based on prospect needs. However, if there is no post-show marketing, you have missed countless revenue opportunities. Unfortunately, many exhibitors do little-to-no follow-up after the event. Post-show contact is an essential part of exhibit marketing and achieving strong trade show results. Click here for tips on how to implement initiatives that boost sales after the show: Trade Show Follow-up.